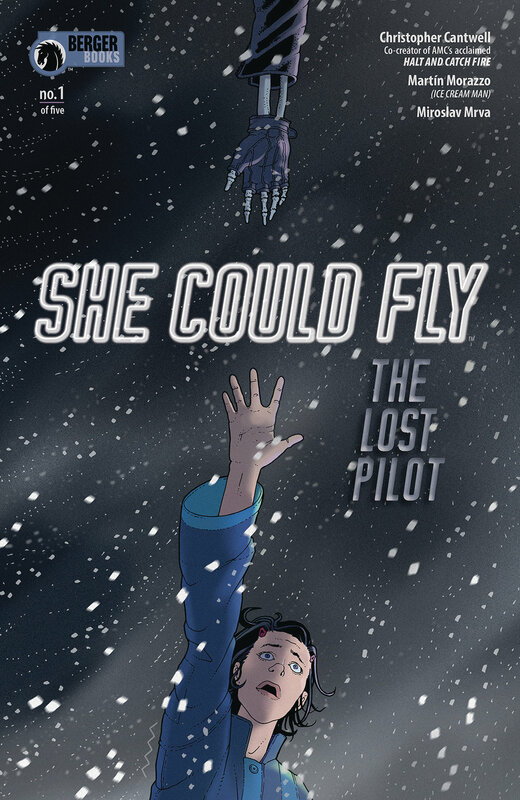 She Could Fly - The Last Pilot #1 is out 4/10/2019. By Zack Quaintance — She Could Fly, a four-issue miniseries that ran last year via Dark Horse Comics’ Berger Books imprint, had a somewhat tidy ending. At least in terms of the emotionality of its story arc. The premise of the book was very very good from the start: a mysterious woman flies through the sky randomly for weeks (like, legit flies), captivating the nation before one day bursting into flames. The series then follows the world’s reaction as filtered through a set of adjacent characters, including a troubled young woman who saw her, a tumbledown physicist who’d been in hiding, and the shadowy government agencies from across the globe interested in the tech. It was a complex setup, one that yielded great returns both in terms of suspense and the way it set about exploring the psychological struggles of the teenage girl at the center. I liked how it wrapped up (not to spoil it too hard, but there was an unsurprising-yet-still-tragic death at its end), which left me maybe a bit surprised that the book was returning for another set of issues. All of that is a lengthy explanation of my mindset when I opened up She Could Fly - The Lost Pilot #1. In the first two pages, we learn that our teenaged hero spent the past year in a mental institution, processing both her pre-existing issues (she often fantasized about hurting herself or others) as well as the violence that took place in her house when the government agencies and rogue physicists all collided last year with each other. She has now been dropped back into her junior year, and from there, our new story is off (with artists Martin Morazzo and Miroslav Mrva throwing in a nice Soar With Confidence poster on the wall to evoke our central soaring motif). She Could Fly - The Lost Pilot #1 is at both an advantage and disadvantage when compared with the start of its preceding volume. We’re oriented and attached to our characters, which lets writer Christopher Cantwell jumpstart his plot by bouncing between a series of reveals about their current status quos. Advantage. However, where the last series had the mystery of who is that woman and how can she fly as a hook, this one must rely moreso on the psychological depths it ultimately explored during the last go around. Disadvantage...sort of, because it is without question a harder way to grab and hold audience attention. Although this issue is not without its plot twists or killer cliffhanger (no spoilers here, though). Cantwell and Morazzo continue to do a great job pacing these stories and intermingling the teen psychological drama with the global scientific espionage. That’s really become the juggling act that defines this book. Bouncing between the two notions is, to be sure, tricky business, but it makes for a compelling comic when done well. In this return issue, the creators nail it, making me grateful the comic is back.